The Cabinet Office, in July 2013, have just made widely available a City of London report which looks at the size, nature, depth and effectiveness of the current Social Investment market. 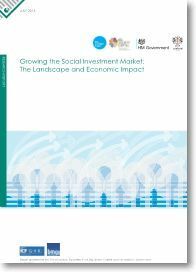 Growing the Social Investment Market shows that In 2011/12 the Social Investment market market surpassed the £200m mark in value for the first time, showing growth of almost 25% in a year. The report strongly evidences the social good that can result from this market growth. ‘The report also shows that there is...evidence of greater coverage of the English regions and Devolved Administrations, which both reinforce London’s concentrated presence in the sector, but still highlights other growth within the UK. There is however, heavy concentration among lenders, with seven SIFIs (Social Investment Finance Intermediaries) providing 90% of social investment capital – and an increasing proportion of this is secured lending’. In 2011/12 the UK social investment market grew by almost a quarter from 2010/11 to £202m through 765 deals. Of the 29 SIFIs actively investing in 2011/12, four large social banks and nine large SIFIs (Social Investment Finance Intermediaries) investing greater than £1m accounted for 97% of the market by value. The volume and value of deals reveals the social investment market was highly concentrated in a relatively small number of SIFIs in 2011/12. There is evidence of greater coverage of the English regions and Devolved Administrations, which both reinforces London’s presence and highlights other developing areas within the UK. This indicates substantial diversity in the geography, sector and social outcomes of investments. There has been an increase in secured lending as a proportion of the total market value, from 84% in 2010/11 to 90% in 2011/12, making this the predominant lending form. Nevertheless, a greater diversity of social investment products was on offer in 2011/12. The majority of SIFIs (89% of respondents) expected to increase their investments in social ventures over the next two to three years. Annexe 3 of the document illustrates how wide the research area was geographically. A positive report, outlining the economic and social impact that Social Investment can drive forward. The blank space in the report, however, is perhaps how to strengthen and widen the role of SIFI’s in the regions. Thereby connecting the regional and local social initiatives on the ground, even closer to innovative, social and effective funding mechanisms. A great example of the coming Social Finance paradigm shift to the regions can be found on the web pages of Social Incubator North. You can read more about SEEM’s involvement in the work on our Press and Media page here. The main home page of SEEM is here.